Democrats Abroad is the official arm of the Democratic Party for the millions of Americans living outside the United States. 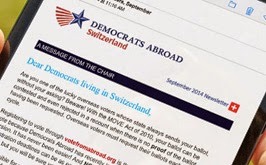 As such, each presidential election cycle, Democrats Abroad holds a global primary, when U.S. citizens and registered Democrats all over the world can cast a ballot for the candidate to best represent our concerns. Beginning Super Tuesday, March 1 until March 8, Democrats living abroad will be able to vote in a dedicated global primary to choose the party's candidate for the presidentatial election. Based on our votes, Democrats Abroad will send 21 voting delegates to the Democratic Party Convention in Philadelphia. PLEOs are "unpledged" — commonly referred to as "Super Delegates" — meaning they are automatically seated at the National Convention and free to support any Presidential nominee. We need to elect 12 pledged (i.e., committed to a specific nominee) At-Large Delegates, one pledged PLEO, and at least one Alternate (each Presidential candidate achieving at least a 15% threshold of the votes cast during our Global Presidential Primary will be entitled to his or her own Alternate). The remaining three At-Large Delegates, one pledged PLEO Delegate, and Alternate(s) will be elected during our Global Convention in Berlin on May 14, 2016. We will also be electing then our three additional DNC Members who, just as with those elected at our Regional Caucuses, will be PLEOs at the next National Convention. The National Convention will be July 25-28 in Philadelphia, PA, at which time the Democatic candidate for presidential election is choosen. And with your help, we will see the next Democratic President of the United States elected on November 8, 2016!